The defining feature of voting intention in this election is how little it has moved. 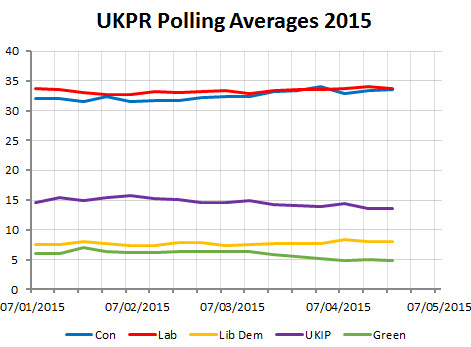 The graph below shows the UK Polling Report polling average for each week so far of 2015. Things haven’t been completely static – at the beginning of 2015 Labour did still have a consistent tiny lead that faded towards a real tie over the first couple of months. There has been a genuine drop in support for UKIP and the Green party, albeit one that is no more than a point or two, rather than a really tight squeeze on their votes. The broad picture though, especially over the short campaign, is one of no movement. This is not necessarily unusual – the huge ups and downs of “Cleggmania” in the 2010 election were not typical. Most historical election campaigns don’t show lots of movement (and I suspect some of that we did see is just the legacy of campaigns when there were far fewer polls, so a couple of outliers could more easily create the impression of movement when there was none). Is there still time for a change, or are we doomed to have election result around about where we are, with the Conservatives and Labour pretty much neck-and-neck? Somewhere between one-in-six and in one-in-five people have postal votes, and many will already have voted, so they cannot change their mind any longer. Between 10% and 20% of people depending on the poll say they don’t know how they will vote, though some of this will be people who won’t actually end up voting but don’t want to say, and some of it will be people who don’t want to give their voting intention to an interviewer (“shy voters”). While it varies greatly depending on how you ask the question a further chunk of people who do give a voting intention say they may yet change their mind before they vote. There are definitely plenty of people who say they may change their mind between now and May 7th… but I suspect this overestimates the volatility of the electorate and that most respondents who say they still might change their minds won’t do so, they just like to think of themselves as fair minded people who will consider all the evidence before making their mind up to vote for the party they were probably going to vote for to begin with. Polls are, as ever, just snapshots of opinion now. They can only quantify what respondents themselves know – they can’t tell how respondents might react to, say, the party leaders Question Time Special next week, any as yet unknown and unexpected events in the final eleven days, or people genuinely recoiling one-way or the other at the very last minute. Realistically though, nothing has done anything to substantially change the polls in the last seventeen weeks and the parties are starting to run out of time for anything else to come along. Regarding reputation they only have to be right on eve of poll. We will never know whose snapshots were correct. I don’t know why all the Ashcroft panic it is just at the extreme MOE and his constituency poll confirms ‘nothing to see here’. There are do many polls we are bound to get a few outliers and extreme MOE. It is no reflection on the polling company just statistics. I live in a one party state called Newham. It means unless I vote Labour my vote is worthless as FPTP robs non Labour voters of a choice. It just adds to the plurality figures nationally. They have PR in Scotland below the Westminster elections and we have PR for the Mayor Newham, Mayor of London and the London Assembly. Yet we are denied PR for our council elections which we were originally promised would happen to any LA that had an elected mayor. Until we get PR at Westminster elections we will end up with unrepresentative unelected governments not chosen by 60% or the people who voted. This was swiftly followed by 16-17 Apr Opimium +4% Cons. I suggest that the polls (taken together) have NOT indicated that either of the main parties has held a significant lead since the DofP- right up to and including Lord Ashcroft’s latest poll today. The problem with that idea is that all polls will have an inherent bias (maybe one will be spot on but it’s quite unlikely). Once you start looking for 4 in a row and get up to 3, giving yourself the freedom to junk a poll that breaks the combo, kind of destroys they point of waiting for significance. You can get an estimate of house effects (or bias if you like) from looking at long term trends of the pollsters, some pollsters put UKIP much higher than the average, some much lower. If you want to get a “better” picture of things it could well be worth putting the poll through a “house effect filter” to make it more “average”. It’d be more reasonable than junking half the polls because they wreck a 5 in a row combo. Just my choosing which polls to junk for being biased, you introduce your own bias into the mix. It’s not wrong to have many pollsters each with different house effects, it’s more likely the true result is nearer to the centre than not, but it’s possible any of the pollsters could have happened on a combination of methodologies the end up “just right”. Each will have their reasoning, you might trust some more than others by dint of their historical performance but they all add to the general picture. I’m curious about ICM. I think they may turn out to be the most accurate pollster. However, whether their final polls next week reveal a Labour or Tory lead (or a tie) is still very much in doubt. Now they have shown Tory leads since January, but their last two polls, subtracting LTV and reallocation of DKs have shown a practically dead heat between Lab and Con. Last week before these weightings were applied Lab and con were level. This week before these weightings Con are +1. Now we know that if the race is tied reallocation of 50% of DKs to the party they voted for in 2010 will assist the Tories – as they were 7% ahead in 2010. As for LTV, some pollsters show this as being very tight. However if I read the ICM tables correctly, the Tories have a much bigger lead in 10/10/certain to vote to the Tories which again skews the figures. Basically the race will hinge on turnout. Bournemouth have sored- now that could be a game changer. In actual fact it literally is! Why do you only take one YG, they are separate fresh polls so you need to include them all (or at least non-overlapping ones) to get a true average, otherwise you are cherry-picking. Wise words, I was getting a bit het up. Moving on, I wonder if Nate Silver will really give a prediction or just wimp out. It’s true that polls with sample sizes of 1000 will give a 95% confidence interval for Con/Lab of almost +/- 3%. So on its own Ashcroft’s 6% Conservative lead is just within the margin of error for neck and neck, as it is also within the margin of error of a 12 point Con lead (unlikely!). It is likely Anthony’s final UKPR polling average this week will have a Conservative lead of 1 or 2 points. You seem very keen on the battle for the wooden spoon! I think when you look at the totality of Ashcroft polling it is very easy to see how the Lib Dems can have approximately twice the % of the Greens in the national polls… Picking out a couple of seats where the Lib Dems and Greens are probably losing their deposits, and where the Lib Dems did far below average in 2010, is hardly representative. The 9% in UKPR average comes from the 57 Lib Dem held seats where they are still above 20% and often above 35%, and a large number of safe seats where they still have strength in local government and will get over 10%. Meanwhile there are the various LAB-CON-UKIP-SNP marginals, and probably some safe Labour seats, where they are down at 5% or less. In contrast the Greens will only get more than 10% in a handful of seats…. Once again I believe weighting to 2010 results will make many pollsters come a cropper on election night when the votes start to be counted. I think this will affect things too. However Yougov are weighting with a poll done in early 2015 which will hopefully better reflect the electorate as it stood on the eve of the election rather than the electorate who existed five years ago. But let’s be blunt: it is not beyond the realms of possibility that Labour could end up with LESS total votes but still gaining more seat than the Conservatives, then Ed Miliband will have ZERO credibility. PRoof that the FPTP system IS flawed? Either way, many economist and business owners feel strongly that the UK could well be days away now from beginning a slow Left-wing death. Is that non-partisan enough based on Ian’s comment directly referring to Tories? Media bias is shameful back in the UK, so why should there be any credibility in the figures conjured up by the pollsters? Suffice to say, it is the same story in many countries. As a dual national, I have already cast my postal vote for next week. Here in Latin America, it would do some of you good to observe the political leaning of the fastest growing economies. Without wealth creation, there is nothing to distribute. I am in Costa Rica; the majority of the population regret putting PAC into Government just one year ago, and look jealously at the success enjoyed by our neighbour Panama of recent years. The media, runs the show…not politicians. The latter can speak what they like. If the media refuses to give it airtime or ask the difficult questions of ALL candidates, then ultimately there can be no credibility, and their rantings become nothing more than farcical political mantra. Nevertheless, with the polls being so close, and so varied, the focus is surely now greater than ever as we wait to discover which one of them has been getting it right along…. As a footnote – UKIP candidates unlike SNP candidtates are represented across the UK. English votes ONLY for English MPs? Why not? Since the Tories need a lead of 3% in the popular vote to get parity of seats it is distinctly possible that Labour will poll many fewer votes but win more seats. Can anyone name a single Labour policy which aims to grow the economy? A million new homes by 2020.